Villa, 3 Bedrooms, 2 Bathrooms, spleeps 6-8, great value. Charming and elegant Villa with garden and pool, 3 bedrooms 2 bathrooms, situated in panoramic position overlooking the enchanting countryside of Chianti area. This wonderful ancient 300 sqm. mansion, dating back to the end of the 19th century, has been finely restored and renovated maintaining the original structure. 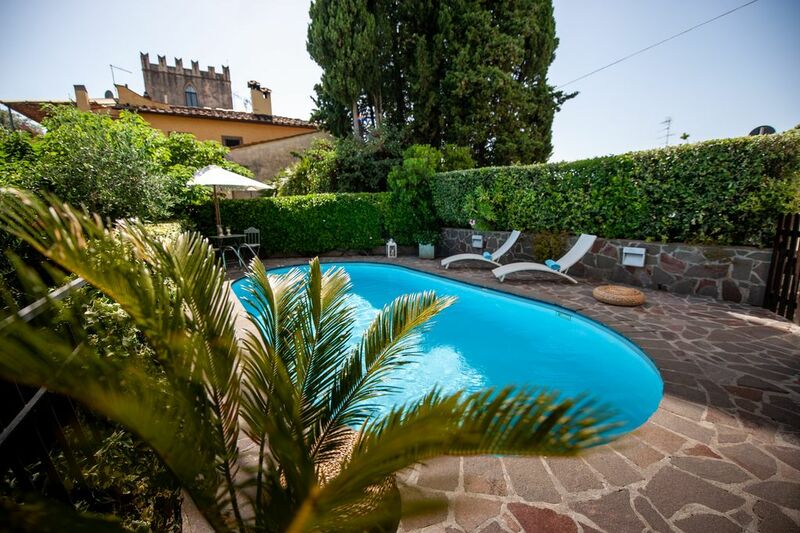 The Villa, equipped with antique furniture, represents an exclusive place to enjoy your stay in Tuscany and a perfect starting point for daily trips to Florence (only 15 minutes away! ), Siena and the Chianti area. The ground floor consists of a wide entrance, full equipped kitchen with great fireplace, dining room with fireplace, living room with LCD television and private gym, bathroom with shower. Laudry room. A large stone staircase leads onto the first floor, composed by 3 double bedrooms (one can be turned in a twin bedded room upon request), a library with frescoed ceilings and a bathroom with shower. Upon request, it is possible to add 2 extra beds (in one bedroom and/or in the library). There is a lovely gazebo equipped with table and chairs, that is perfect to enjoy your breakfast and to dine al fresco! You can also relax with a glass of wine under the patio or just laying by the pool… From the garden you have a sweeping view of the rolling hills, olive groves and vineyards around. The garden, gazebo, patio,barbecue and the pool are for exclusive use of the guests. The owner, who lives with her family on the second floor of the Villa, has a separate independent entrance. She will be at your disposal during your stay for any need and requirement. The Villa is located in the small village of La Romola, where you can get basic provisions (bar, grocery…). 2 miles away is the nearby village of Cerbaia, where to find all the main services. Only 3 miles more to get to the ancient hilltop town of San Casciano Val di Pesa, full of restaurants and wine shops, supermarket, bank, post office….and a lovely outdoor market (on Monday morning!) where to buy the freshest produce such as meat, fish, vegetable and flowers. Never forget that Florence is just around the corner (7-8 miles! ), and if you don’t want to drive there is a bus stop close to the Villa. In 15 minutes you’ll be in the city centre of Florence where to visit its famous monuments and museums and enjoy its magic atmosphere. Since we are in the middle of Chianti, renowned for its wineries and wines, it is possible upon request to organize wine tours around or private wine tastings at home and to plan also homemade typical tuscan food @home …..
Hi, my name is Carla! I was born here, in this Villa, that my family owns since many generations. I love this place and its marvelous view on the hills. I live on the second floor of the Villa with my family. There is a second independent entrance, so your privacy will be guaranteed. It will be my pleasure to help you during your stay for any requirement. The location allows to enjoy the typical tuscan countryside with its olive groves, vineyards and rolling hills and at the same time to reach Florence in few minutes by car or by bus. Many hills towns nearby as well as important cities as Siena and Pisa. The large bathroom downstairs comprises full shower, sink, bidet and toilet. The bathroom upstairs, recently renovated, has full shower, sink, bidet and toilet. Both have window, and comprises a starter kit of 1 toilet paper. with a starter kit of 2 caps of soap. Treadmill, weights and bench press, stepper, exercise bike. At your arrival you'll find a starter of salt, pepper, sugar, spices, oil nad condiments, bottled water, wine, paper goods. Both the dining tables indoor and outdoor can accommodate up to 8 people. The pool is for exclusive use of Guests. Wonderfully situated in La Romola with lots of day trip options short distances away. With Florence so nearby, we had a chance to visit several times and see sights without trying to get to everything “important” in too much of a hurry. Our favorite discovery was Luca. When we arrived there was a basket of garden goodies (tomatoes, hot peppers, garlic, onion) along with a box of pasta, olive oil on the kitchen island. We used all of it for an impromptu meal one night. The kitchen is wonderfully appointed and I am just sorry that we were having so much fun — and so much lunch! — on our day trips that we didn’t do more cooking. But having snacks on the patio near the pool was our reward after lots of walking and sightseeing. There were just four of us and the villa could easily accommodate another couple along with a handful of children. Lovely time. Carla & Andrea are wonderful hosts - you will be impressed as soon as you walk in the door! You are greeted with smiling faces and warm hearts as you are guided to tour the magnificent home filled with family treasures! The home is charming and well equipped; you will be pleasantly comfortable staying in the villa; no surprises whatsoever. You have complete privacy and if needed, Carla &/ or Andrea will be there quickly! We were a group of 7 people - highly recommend staying at this beautiful, quite property. Cute little town, felt safe, perfect gentleman who mans a small but complete grocery shop down the road with ample fresh meat, produce, cheese, non-perishables, etc... Carla recommended professional chef to come to the house to prepare dinner for us - an experience which highlighted our vacation. Could have stayed longer to enjoy the tranquility and peacefulness of the space. Enjoy! Carla and her family are great hosts. They gave us great recommendations and were easy to contact if needed. The villa is very spacious, beautifully presented and the kitchen is very well equipped. My friends and I had a great time staying here and would highly recommend it to others. We had a very nice stay. The villa was clean and well appointed. Carla was very helpful and attentive to any issues which arose. Absolutely beautiful villa with great views and a wonderful owner!!! We really enjoyed our stay here. We were a group to two sets of grandparents, my wife and I and our toddler son. It is located in a quite town close to florence. We only stayed four nights. It would have been better to stay longer. It took us a day or two to get our bearings. It's pretty important to have a car or be prepared to pay for a car service. The drive into florence takes about 40 minutes to the city center. Maybe a little less because we had a big van. The first time was a little stressful but once we figured it out it wasn't to bad getting into the city. Be careful because a portion of florence you can't drive in without a special permit. Restaurants and grocery stores are 15 minutes away (but with beautiful drives) Carla was great and extremely helpful. The villa was very clean, the kitchen well equipped and has plenty of space. The outside areas are wonderful to relax in and we had an amazing dinner grilling a bisteca de fiortina (a massive t bone that is one of florences specialties) and sitting at the outdoor table. We would love to go back and stay for longer. A family group including my elderly parents stayed at this villa in September. The house is spacious, beautifully furnished and well equipped. Carla and her family were warm, welcoming hosts and were very happy to help and advise us . At the same time they were discreet and we felt very much at home. La Romola is very well located for exploring the Florence area and provides a quiet haven after a day of exploring. Highly recommended. Upon request, wine and oil tastings, chef @ home. Only 15 minutes by car or by bus from Florence city centre. Bus stop at 300 meters. Final cleaning fee: €230,00 due cash at check out Security Deposit: €500,00 due cash upon arrival Check-in after 5 p.m. Check-out within 10 a.m.